Latin-Asian fusion has been a popular culinary trend in recent years from fine dining to street food. In the latter category, a popular dish is the Korean taco, combing Mexican taco elements with Korean-influenced fillings. The most famous proprietor of this dish is Kogi Korean BBQ, a Los Angeles-area food truck fleet. However, others have brought the successful concept to other cities, including TaKorean in Washington, D.C., one of my favorite downtown food trucks. 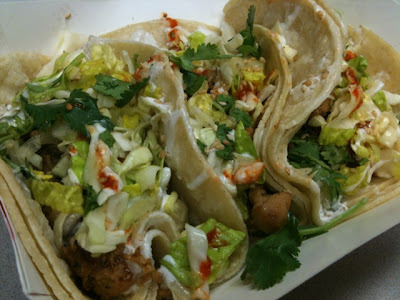 They serve Korean tacos with beef bulgogi, tangy chicken or caramelized tofu, topped with either napa-romaine or kimchi-style slaw, lime crema, cilantro, sesame seeds and sriracha, a Thai-style hot sauce. Pictured below is TaKorean's tangy chicken tacos with napa-romaine slaw and the works, which I enjoyed for lunch on a recent Thursday. Could I successfully recreate this dish at home? 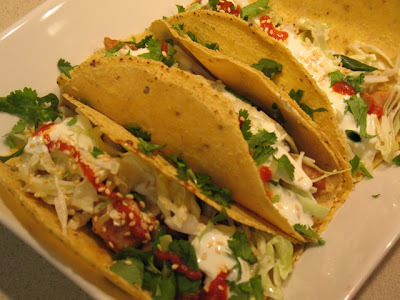 I combed the web to research various recipes for Korean tacos and specifically bulgogi-style chicken dishes. Since I don't have a barbecue, I needed a bulgogi I could make in a saute pan, a technique I've had success with before when making beef bulgogi. I sliced the chicken very thin to maximize exposure to the sauce and allow it to cook fast. For the marinade, which would double as the sauce, I wanted bold flavors and not too much liquid, since I didn't want to end up boiling the chicken in it and I wanted it to reduce to a glazing by the time the chicken was done cooking. So I turned to ingredients with lots of flavor: tamari (concentrated soy sauce), mirin (sweet Japanese rice wine), garlic, dark sesame oil and brown sugar. I was concerned about making this too sweet, so I used less sugar than many of the recipes I saw. I let this marinate in the fridge for about an hour and a half. For the slaw, I wanted something fresh and simple. Although many recipes called for napa cabbage, the heads of napa cabbage at the store were huge, and I didn't feel like also making coleslaw another night, so I used about a third of a head of regular cabbage (and even then had a lot left over) and the green part of a few scallions tossed in a simple lime, vinegar and oil dressing. Lime crema sounds so fancy, but it's really just sour cream mixed with lime juice. I added some zest too. Choosing good tortillas is important. Corn tortillas are the traditional choice for tacos and it pays to be choosy. Fresh corn tortillas, found in the refrigerated case, have a better corn flavor than the preservative-laden variety on the store shelf. A good tip I once read was to look at the ingredients list and choose the tortillas with the shortest list. The ones I got are from Whole Foods. They were pretty hearty too and held up to the fillings without falling apart with a single tortillas (tacos are often served with two corn tortillas to prevent them from falling apart). While a multi-step project like this requires a little planning, this dish is certainly doable for a week night. I prepped the marinade and the slaw first, left the kitchen for my early evening workout, and then came back to cook the chicken, make the lime crema and assemble the tacos. I served them with a simple side dish of black beans with garlic, cumin and lime. The results were very tasty (see top photo), dare I say better even than what I get at Takorean. Feel free to mix it up as you please. 1. 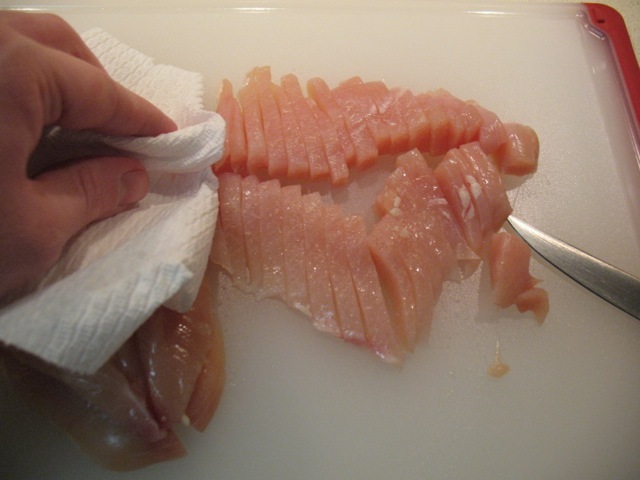 Prepare the marinade: Slice the chicken breasts in half and then very thin (about 1/4 inch). 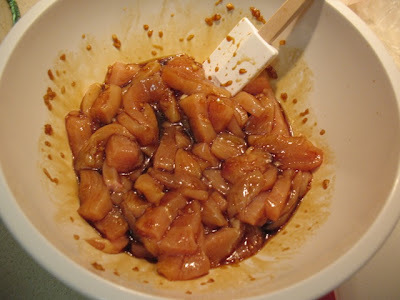 Combine in a bowl with tamari, brown sugar, garlic, sesame oil and mirin. Put in fridge to marinate for about 1 to 2 hours. 2. 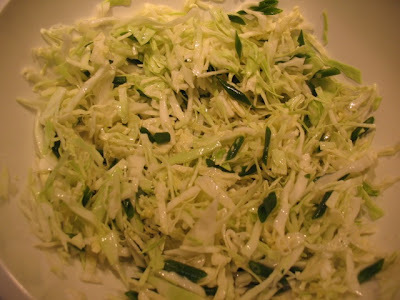 Make the slaw: Mix together the vinegar, lime juice, canola oil and sesame oil and combine in a large bowl with the shredded cabbage and sliced scallions. Set aside until ready to use. 3. 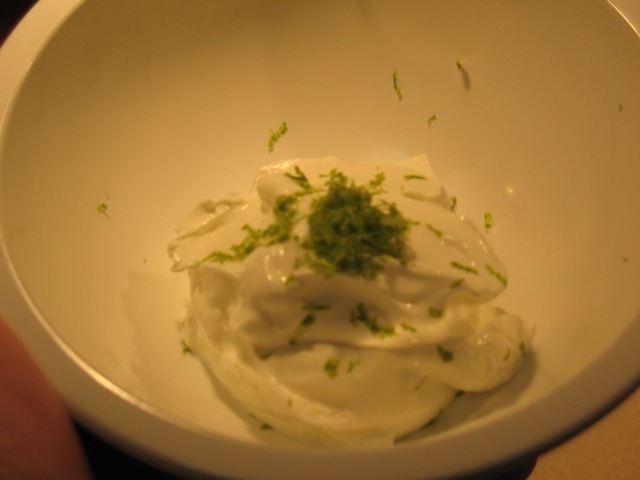 Make the lime crema: Mix together the sour cream, lime zest and lime juice in a small bowl. 4. Cook the chicken: Heat 1 tbsp. canola oil in a large nonstick oval skillet pan over medium-high heat. When very hot, add the chicken and the marinade and saute until cooked through and sauce has reduced to a glaze on the meat. 5. Assemble tacos: Place one or two stacked corn tortillas on a plate. Top with 1/6 of the chicken (about 3 tbsp. ), a couple tbsp. of slaw, a drizzle of lime crema, a drizzle of sriracha (it's hot), and a sprinkling of cilantro and sesame seeds. Repeat to make other tacos. Serve with a side of black beans and the rest of the slaw. Heat olive oil in a small saucepan over medium heat. Add garlic and saute until softened but not brown. Add other ingredients, reduce heat to medium-low and simmer until warmed through and fragrant. Top with chopped cilantro or queso fresco if desired. Yum. You have my permission to make this again. And again.